StratosFEAR! is a 1-Vs.-3 Mic minigame in Mario Party 7. Its name is a portmanteau of "stratosphere", due to the sky setting, and "fear". 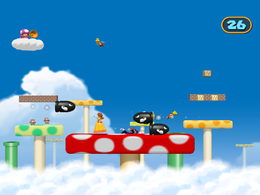 The mushroom platform rises to the center of the screen, and a Bullet Bill flies toward it. The team players jump to avoid it, and the third character takes it down. The single player moves the mushroom platform with the voice commands "move up" and "move down". The team is on the platform, and needs to dodge the incoming Bullet Bills. The characters can jump on the enemies to defeat them. In the background, what looks like a redesigned World 1-3 from Super Mario Bros. appears. Two Goombas jump up and down on another mushroom platform while two red Koopa Paratroopas fly back and forth between a cloud platform and a Question Block. Mic – Say: "Move up", "Move down"
Rules – "One player moves the platform up and down in an attempt to make Bullet Bills hit the other players." Advice – "If a Bullet Bill is headed your way, jump on it to make it crash." This mini-game shares its name with the sixth level of the Homestar Runner game Stinkoman 20X6, which, coincidentally, was released earlier the same year. This page was last edited on May 31, 2018, at 08:15.